View More In Slow Cookers - Page 7. 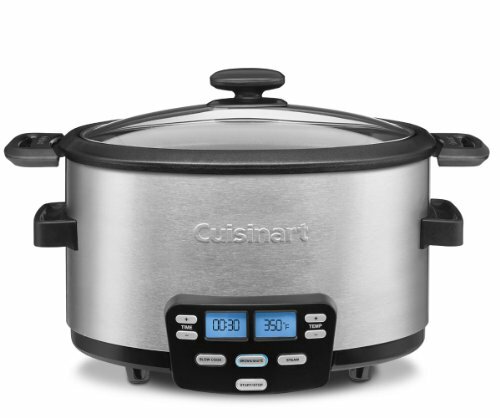 Create one-pot meals your family will love with the Cuisinart Cook Central 3-in-1 Multicooker. Three fully programmable cooking functions let you sauté vegetables, brown meats and slow cook your favorite comfort foods right in the unit. Skip the stovetop with combination cooking -- brown your ingredients in the unit and then simply switch to the slow cook function. 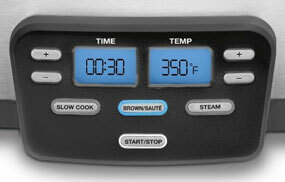 Use the Cook Central to prep any aspect of your favorite dish. Select the steam function to prepare stuffed artichokes to start a gourmet meal or to create a healthful vegetable medley side dish. The Cook Central can even do dessert. With numerous recipes to choose from in the included booklet, the opportunities are endless! 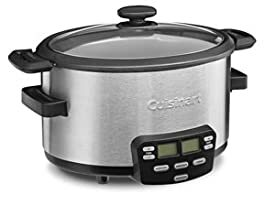 The Cook Central features Cuisinart’s brushed stainless steel housing and a 4-quart nonstick cooking pot that lets you brown or sauté directly in the unit. Once your meal is ready, the unit will automatically shift to Keep Warm mode so your meal is ready when you are. Serving your dish is easy -- just lift the pot out and take it to the table. Clean-up is a breeze with the Cook Central as the pot, steaming rack and glass lid are dishwasher-safe. Steaming is one of the healthiest methods of cooking. No butter or oil is required and fewer nutrients are lost in the steaming process. To steam anything from asparagus to shrimp, insert the included steaming rack and no more than 1 quart of water or other liquid in the cooking pot and cover with the lid. Once steaming is complete, carefully remove food from the pot with a spoon, fork or tongs and enjoy. Use the Brown/Sauté function as you would a skillet or sauté pan on the stovetop for a variety of recipes. Prepare a quickly sautéed skillet dish or brown food right in the pot as the first step of your family's favorite slow cooker recipe. You can use this function to reheat foods as well. Just use Brown/Sauté at 350 degrees F and stir until all ingredients are warmed through.